…and here’s the CubeSat version being crushed. It holds up pretty well, considering. A 3-D digital prototype printer has been considered for direct digital manufacturing of components because this technology has many benefits compared to conventional manufacturing technologies. 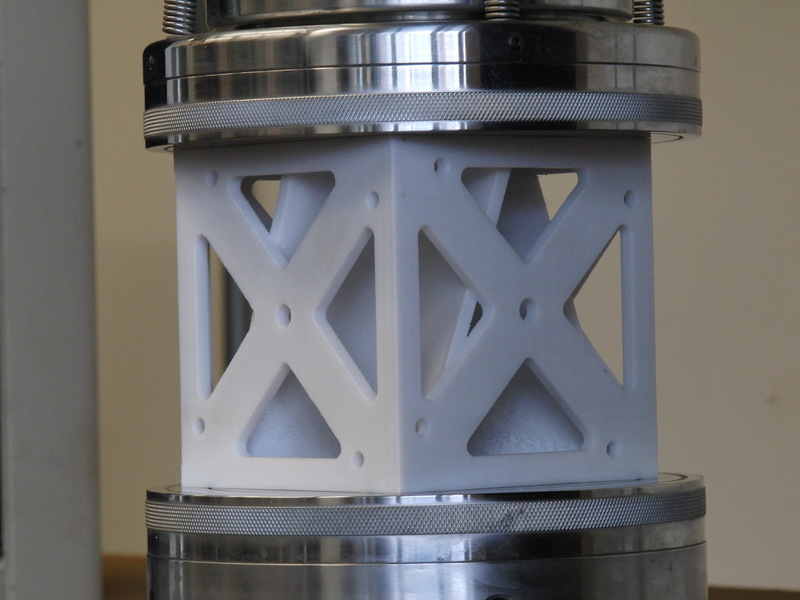 In order to assess the applicability of the direct digital fabrication to a critical structural component, mechanical properties of the digitally fabricated component should meet the design or performance requirements. Furthermore, it is necessary to be able to predict the mechanical properties of the fabricated component based on the input parameters of the 3-D digital printer. The present project measured the mechanical properties (i.e. strength and stiffness) of samples fabricated f rom a 3-D digital printer as a function of processing parameters, determined predictive model connecting the input parameters to t he 3-D digital printer and mechanical properties of the fabricated samples by using a statistical design of experiments and multivariate regression, validated the model using crush-strength experiments on the NPS CubeSat structure, and to hosted the CubeSat challenge. Young W. Kwon, Luke N. Brewer, Rudolf Panholzer, Daniel J. Sakoda, Chanman Park. (2010). Direct Manufacturing of CubeSat Using 3-D Digital Printer and Determination of Its Mechanical Properties. Naval Postgraduate School. Amanda D. Stein. NPS Crushes CubeSats for DARPA Challenge. Naval Postgraduate School.